Every second lug is seated on one metal core and the adjacent lugs straddle two metal cores. The lugs on the other side of the track are positioned to ensure that each metal core in the track has one fully seated lug. This reduces the possibility of track weakness due to tearing. Construction of X-TRAC incorporates 3 wound up metal cores which results in increased bend ability of the track when the crawler is in action. 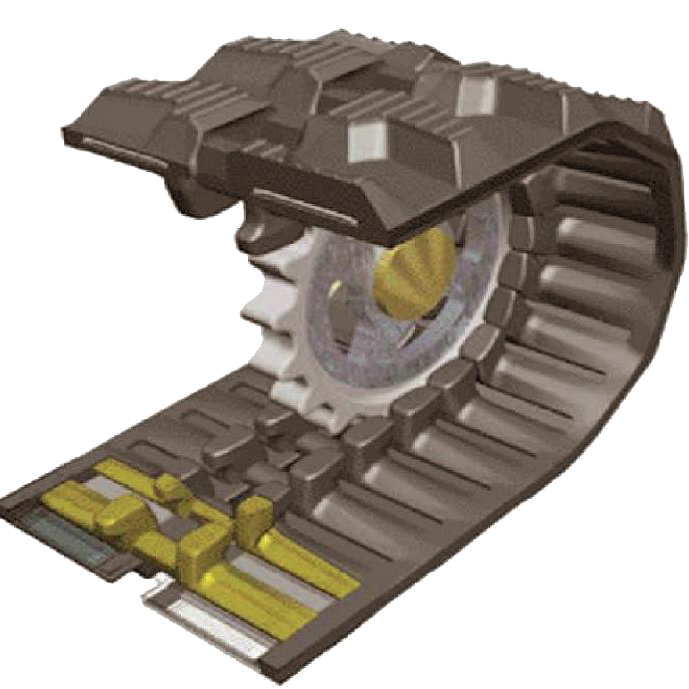 This results in low vibration and reduction in noise level which leads to less driver fatigue and improved safety. The edges are designed with thicker rubber added between the lugs. This reduces the incidence of slicing of the edges resulting in a longer operating cycle. Lugs on both sides of the track face each other in opposite directions to allow a bi-directional driving behavior. Feel of forward and reverse motion characteristics of the machine is similar. Tracks are interchangeable and can be rotated at any time. Uniform and small lug size ensures consistent high performance with enhanced grip & traction: smaller contact surface.